Port Elizabeth - AB de Villiers hopes the Proteas can bat on to a substantial total on the second day of the second Test against New Zealand at St George’s Park. South Africa finished on top with 325 for four at stumps on day one, an innings buoyed by Hashim Amla’s 19th Test century. “We haven’t thought of that,” De Villiers said on a possible first innings score. “We want to bat as long as possible and we believe that, if we can bat them out of the game in the first innings, it will put a lot of pressure on them. De Villiers’s 51 saw him become the fifth South African to score 6 000 Test runs, however that milestone seemed a minor feat on a day highlighted by Amla’s century. South Africa’s leading run-scorer in 2012 overcame difficult swinging and two-paced conditions to carve out yet another century for the Proteas and his fourth against New Zealand. “He is a wonderful player,” De Villiers commented of his team-mate. “I enjoy batting with him, he is calm at the crease and we all feed off that. He is the rock for us at number three, together with Kallis at four; they are the best three and four in the world which is an important combination for us. Amla partnered in three successive partnerships of more than fifty with Graeme Smith (92 runs), De Villiers (86 runs) and Faf du Plessis (102 not out), which allowed the batsmen to capitalise on Smith’s decision to bat first. 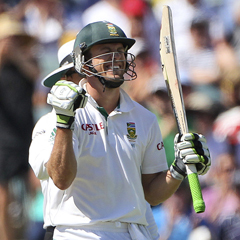 Amla (106) and Du Plessis (69) will resume their unbeaten fifth-wicket partnership of 102 on Saturday.